The flu vaccine is often found to be the subject of debate. It becomes even more of a hot topic when you realize that the flu shot doesn’t always prevent the flu. Yes, it’s true, the flu vaccine doesn’t prevent the flu, not in the way that most vaccines (HPV, measles, hepatitis B, etc.) prevent illness. The best flu vaccine prevents the flu in 40 to 60 percent of those who get the shot. Now, before you say, what’s the point then, let’s explore more facts to help you make the right decision for your child(ren). The truth is less than half of the children in the United States are immunized against the flu. For parents the number immunized is even less. Many people believe the common flu myths shared via social media and spread the old-fashioned way – word of mouth. Instead of basing your flu knowledge and your decision on whether or not your child should get the shot on misinformation and myths, let’s get to the truth and then decide. It is well-established that the flu vaccine doesn’t always prevent the flu, but it does reduce the risk and in most cases, it prevents hospitalization and death from the flu. No vaccine delivers 100 percent protection, because flu virus strains are constantly mutating. Targeting those stains is somewhat of a guessing game, one which the experts seem to be winning (18 out of 22 flu seasons). On top of that, the flu vaccine reduces the severity of infections should you or your child get the flu. Myth: The flu vaccine causes the flu. The dead/inactivated viruses in the flu immunization do not cause the flu in immunized individuals. While the nasal-spray vaccine version does, in fact, contain live viruses, they are simply not strong enough to make anyone sick. Common, mild side effects of the nasal vaccine are fatigue, runny nose, low-grade fever, aches, or sore throat and occur as the body builds a defense of antibodies to fight the flu virus. Those who become ill with the flu shortly after receiving the vaccine had the virus already in their system prior to receiving the injection. Myth: My infant/toddler/preschooler doesn’t need another shot. Many parents don’t get the flu shot for their children because of the number of vaccines their children have already endured. The important fact to understand is little ones, up to age five, are in the high risk group for flu complications like dehydration, pneumonia, and hospitalization. Their immune systems are still in development which makes them more susceptible, and with more than 20,000 children under the age of five hospitalized with the flu annually, it’s probably not a risk most parents want to take. 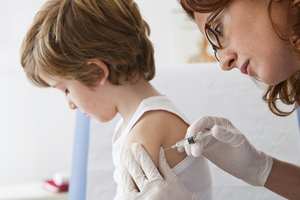 Myth: Children with egg allergies can’t get the flu shot. It is true that the flu shot, and the nasal flu vaccine possess egg allergens, a result of the vaccine growing in chicken eggs, and so children with egg allergies were once told to avoid the vaccine. But a recent study in 2012 found the low amount of egg protein is too small to cause an allergic reaction. If you are still unsure, ask your doctor to monitor your child after administering the vaccine. Myth: Autism is caused by the flu vaccine. There is no evidence that autism is caused by the mercury based preservative, thimerosal, which is present in the flu vaccine. A 20-year-old study which appeared to make the connection between thimerosal and autism was summarily shown to be fabricated and is the source of this erroneous myth. If you are concerned, preservative free flu vaccines are available. Whether or not to get a flu shot for you or your child is up to you. Now you have the facts and can make a confident decision on what is best for your family.